Timeless in style, this collection, with its subtle Italianate overtones, threads its way between Tradition and Modernity. 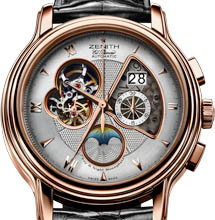 This icon of the ZENITH Manufacture, inspired by the neoclassical, is a celebration of Time. From the double gaudron case to the authentic barleycorn guilloche, it has a look that harks back to the great watchmaking tradition. 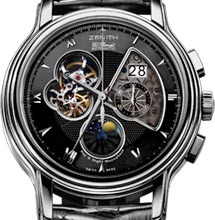 Its boldly innovative design allows the 36,000 vibrations per hour of the mythical El Primero chronograph to be glimpsed at the heart of the movement. This collection, timeless yet strikingly modern, which now joins the Haute Horlogerie universe along with the ChronoMaster Open Grande Date Moon & Sunphase, has been enriched with new complications over the years, thus writing new chapters in the history of the ZENITH brand. Masterpiece of the ChronoMaster 2009 collection, its resolute classical elegance offset by modernity: the ChronoMaster Open Grande Date Moon & Sunphase will surprise. 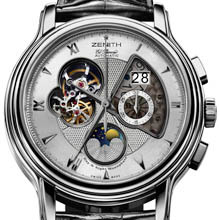 Illustrating yet again the Manufacture’s specialist ability, this unique complication of a Grande Date, Moon and Sunphase chronograph reveals a new El Primero 4047 calibre, with 332 components and 41 rubies, through the opening in the dial. The barleycorn guilloche on the dial, the wavy guilloche on the counters and the moon disk, the delicately pearlised plate and the guilloched oscillating mass are so many precise and refined indications of authentic watchmaking know-how. In one 45 mm size, the rose gold cases show off a silver dial whilst those in stainless steel offer the choice of a black or silver dial. Aristocratic and refined, the ChronoMaster Open Grande Date Moon & Sunphase records the mechanical measurement of Time in style.